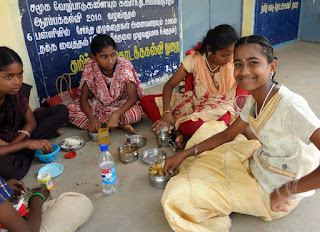 For the month of May, (summer school holiday time in India) we organised a five day camp for the teenage girls who have been attending our awareness programs. Topics covered included education, career counseling, moral life, abortions, feoticide and infanticide. Special speakers came to cover some of these topics. Talks, as usual, were interspersed with lots of games, competitions and fun activitites. 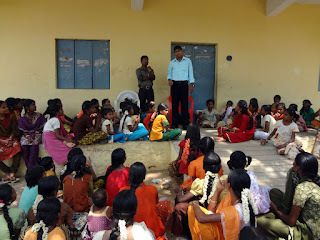 The first day, about 60 girls attended, the second day, 90 and the third day, over 100. 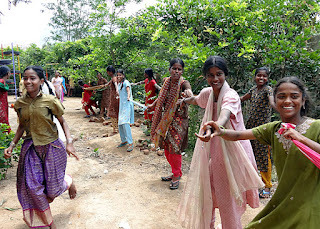 Many more girls wanted to attend from villages further away, but were unable to because of transport difficulties, so next time we will look into the possibilities of organising transportation for them. PHOTOS: Top left - some of the attendees; top-right - lunch time; bottom left - fun and games; bottom right - special guest giving a talk.